The leading electronics and semiconductor market research analysis company IC Insights forecasts the total global electronic systems sales to reach US$ 1.74 trillion in year 2017, a compound annual growth rate of 5% from US$1.36 trillion in 2012. 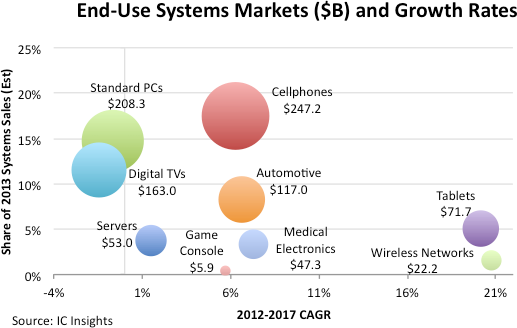 IC Insights estimates the total electronic systems market by sales revenue of US$1.4 1 Trillion in year 2013. IC Insights has come out with a report called "IC Market Drivers report" on the market analysis of several existing and emerging end-use applications that will drive the IC market through the year 2017. 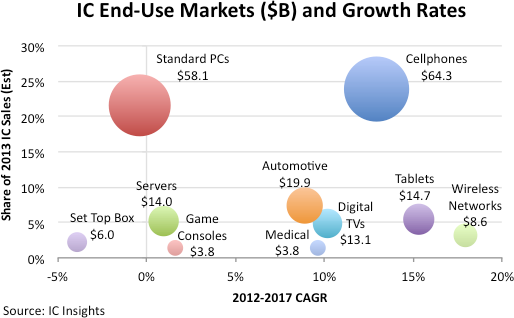 IC Insights finds cellphones overtaking standard personal computers (desktop and notebook PCs) as both the largest electronic systems market and the largest end-use application for ICs in 2013 for the first time ever.